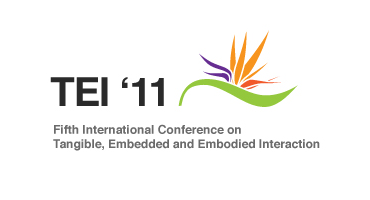 NearInteraction was a donor sponsor at this years TEI’11. The fifth international conference dedicated to presenting the latest results in tangible, embedded, and embodied interaction. It took place between 23rd to 26th January 2011 in Funchal, Madeira, Portugal. The work presented at TEI addressed HCI issues, design, interactive art, user experience, tools and technologies, with a strong focus on how computing can finally bridge atoms and bits into cohesive interactive systems. This conference was best known as a unique forum for exchanging ideas and presenting innovative work through talks, interactive exhibits, demos, hands-on studios, posters, art installations and performances. exciting new interaction design, curated by NearInteraction: a chronicle of the things we love and that inspire us.